The aim of the "HR Transformation Knowledge Bank" is to provide a set of useful resources for all those involved in transforming Human Resources and People Management. It includes documents, links & videos on HR Shared Services, HR Outsourcing, HR Transformation, Leadership, Organisation Design & Change Management. 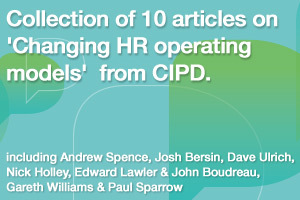 A survey report from CIPD, June 2009, HR Outsourcing and the HR Function – Threat or Opportunity? 2008 Global HR Transformation Report (conducted by HROA (Human Resources Outsourcing Association) in association with ADP). This is the 5th annual survey with 129 executives around the globe in varying stages of HR Transformation. Click this link to download the 2009 Global HR Transformation Report. CIPD The changing HR function – September 2007. This is a useful report on how organisations have adopted the Ulrich model which incorporates centres of expertise, shared services and business partners. The HROA is for all those who purchase, provide, or participate in HR transformation and outsourcing. The site has some useful resources on HR Outsourcing, HR Shared Services, HR Software, Leadership and People, Recruitment Process Outsourcing and Learning. See our HR Transformer Blog article Stop, Start and Continue – A Guide for HR Transformers and download our Stop, Start, Continue Worksheet. Here is a link to GlassBeadConsulting's Slideshare for presentations that we have developed and also for those that we have found interesting or informative. Visit GlassBeadConsulting's Channel at YouTube, for videos we have found interesting, amusing or useful.